Quilting friends are so special! We share the joys of talking about quilts, fabric shopping, and making quilts, and we support, encourage, and admire each others' talents. 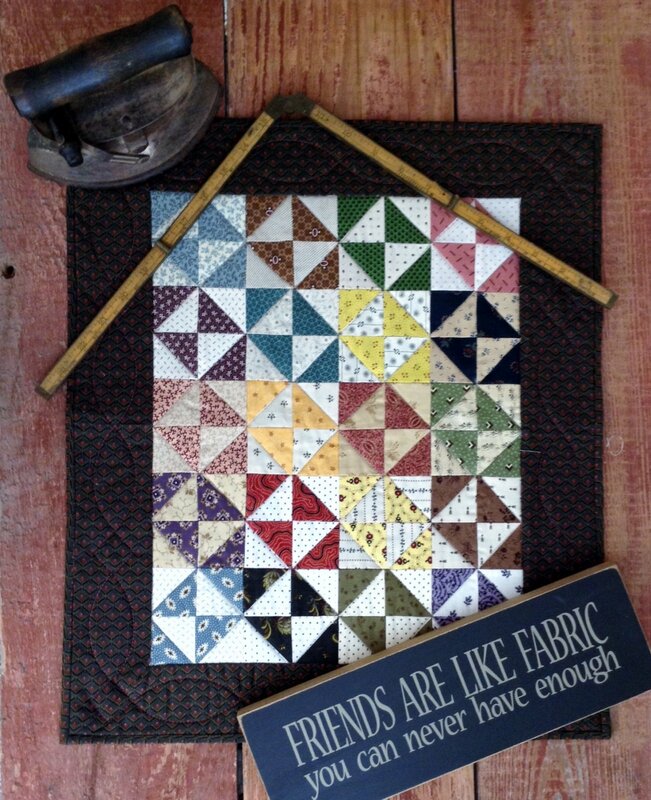 Making this small quilt would be a good way to thank a dear friend for being the special person she is. Dear Friends is made up of 20 broken dishes blocks using a contrasting light and dark. We selected 40 different prints from our collection of Reproduction Fabrics. Finished quilt measures approx: 16" x 19". The kit includes the Vintage Legacies pattern "Dear Friends" from Carol Hopkins, all the fabric for the top, the binding and the backing. This is an Extra Rinse Cycle kit - where we give you tips on constructing this traditional block using modern techniques. We used 1.5" Finished Thangles to construct the Broken Dishes. The Thangles are not included in the kit, but are available for purchase.